Inner fire practice (“Tummo” in Tibetan) is a mysterious esoteric cultivation that is dreamed of by esoteric practitioners, yogis and whoever is pursuing achievement. It is the foundation for advancing towards supramundane Great Perfection Dharma, and requires a certain root capacity and harsh training for the practitioners. The “Spiritual Fire”, hidden energy inside of human body, can be unleashed through the secret mantra and mudra and the secret code from the Vajra Guru, after practicing for a period of time. It can increase the adaptability and resiliency when facing disasters. 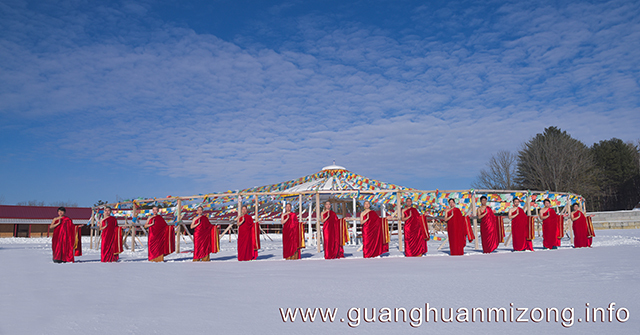 During a 6 °F winter day, Holy Ziguang Shang Shi offered this special training to the disciples who had built up a certain cultivation foundation. 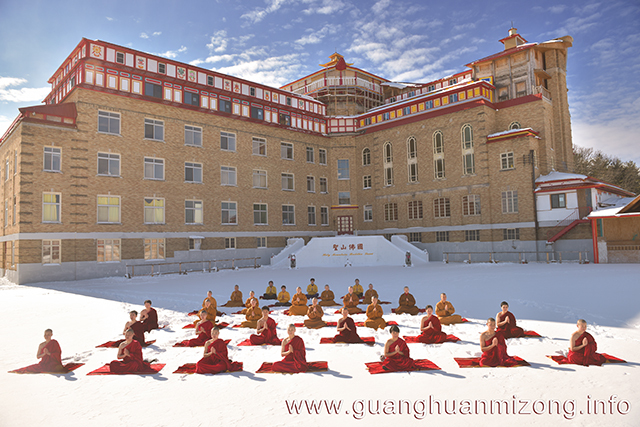 The cultivators were meditating in the snow for over half an hour, with only a red robe to protect them from the bitter cold. Empowered by Holy Ziguang Shang Shi, they were chanting secret mantra and making mudra for attuning their body, speech and mind to the energy of the Buddhas. Far from being cold, they actually generated enormous inner heat that burned away impurity inside of the body, thus the bad karma was removed and clear, pure wisdom arose. The amazing spiritual energy led to transcendental bliss and awakening of soul for the cultivators. 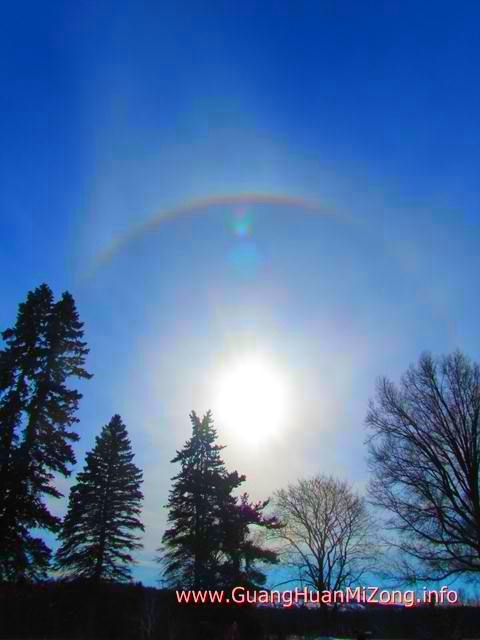 A splendid halo in the sky showed the manifestation of the blessing from Buddhas and Bodhisattvas in the Space Realm. The cultivators were very grateful for the precious chance given by Holy Ziguang Shang Shi to practice this supreme dharma.